Beginning in May 1915, Kaiser Wilhelm II ordered his forces to bomb Britain, specifically targeting military bases, fuel supplies, ammunition stores, and the London Docklands. The Germans believed that these attacks would be the most detrimental to the British offensive, as they would knock out their supplies, demoralise the troops, and destroy one of the centres of British maritime activity. The airships used in the attacks were known as zeppelins, after their manufacturer, and targeted most of the eastern coast of Britain. Germany’s airship technology far outstripped Britain’s – zeppelins could fly several hundred meters into the air and drop incendiary bombs with good accuracy, completely avoiding the British planes below them. Because of this, London was not well defended, leading to blackouts at night, loss of valuable supplies and property, and many deaths. World War One was the first instance of aircraft used as weaponry, which led to it being called the first modern war. Being in close proximity to transportation hubs, the Thames dockyards, and military buildings, Westminster was hit hard during the war, especially between November 1916 and March 1918. 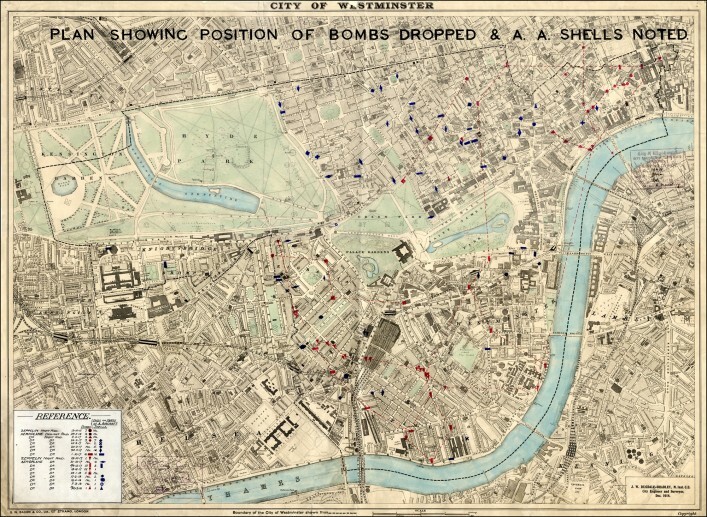 Based on a bomb map of Westminster created by engineer J.W. Dudgale-Bradley in December 1918, the German air forces had a definitive strategy. They would target train stations, military buildings, and centres of local government to best disturb the peace and safety of the people of Westminster. The first raid on London was 31 May, 1915, and through 1915 the city was attacked about once a month; from 1916 onward, the bombings became slightly more frequent across the country, although Westminster was only hit for one night. It was at this point the government ordered total blackouts at night, to deter air raids, but the light of the moon on the Thames was more helpful to the Germans than streetlights. 1917 was the year of the heaviest attack, as Westminster was hit ten times by live explosives, unexploded bombs, or shrapnel, largely in September and October. By this time, the British had improved their planes enough to chase the zeppelins and shoot them down with specialized bullets: the Pomeroy and the Buckingham. Pomeroy bullets were fitted with a nitro-glyceride tip, which caused them to explode on impact, rupturing the hydrogen-filled bags which kept the zeppelin afloat. Buckingham bullets were incendiary, trailing flaming phosphorus behind them. When the fire came in contact with the leaking hydrogen, the zeppelin would explode. After this discovery, the Germans began to use bomber planes, and attacks on Britain from these aircraft lasted until the end of the war. 1918 only saw one live bomb hit Westminster, but based on its location near St. James’s Square it was likely dropped accidentally.